Piqua, Ohio, March 10, 2014 – The Federal Aviation Administration has awarded Hartzell Propeller a Supplemental Type Certificate to install the company’s recently type certified high performance Bantam series three-blade propeller on diesel-powered Cessna Skyhawk aircraft. The Hartzell Bantam propeller series are small, lightweight two and three blade propellers with a thin, wide chord and swept high performance airfoils. 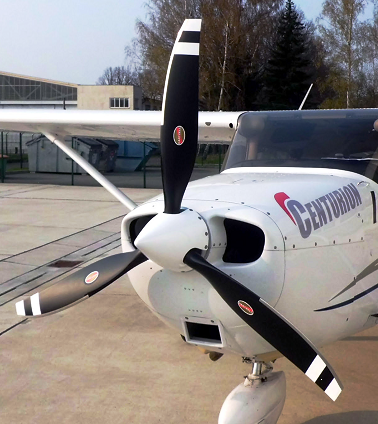 The recent approval covers installation of Hartzell’s three-blade Bantam propellers, featuring carbon fiber structural composite blades and composite spinners, on Cessna C-172s with Centurion diesel engines. The lightweight Bantam three-blade propeller weighs 35.3 pounds, including spinner, and replaces the previously supplied wood-core propellers. The superior strength of the carbon fiber structural composite material enables the Hartzell Propeller engineering team to design blades with wider chords and thinner airfoils, ultimately leading to higher performance and durability. With a new Bantam propeller the aircraft cruises approximately three knots faster from 75 percent up to max power, has 15 percent faster acceleration time to 45 KIAS and shows a 50-75 fpm increase in max power rate of climb. The Bantam series propellers utilize Hartzell’s proven durable carbon fiber monocoque construction, including field replaceable electroformed hard nickel erosion shields, allowing for maximum damage tolerance and field repairability, important in flight school environments and on unimproved runways. The three-blade Bantam propellers for Centurion powered Skyhawks have a 2,400 hour recommended Time Between Overhaul as well as a warranty that covers the propeller and spinner for three years or 1,000 hours, whichever occurs first. The new propellers are available through Hartzell’s Top Prop performance conversion program. Hartzell Propeller is the leader in advanced technology propeller design and manufacturing, with more than 3,700 propellers delivered annually to commercial, civil and government customers. The company developed the next generation of propellers with innovative “blended airfoil” technology. It manufactures these blades using a combination of revolutionary machining centers and robotics. With its ASC-II™ composite technology, Hartzell provides mission-optimized performance for customers. Hartzell Propeller traces its beginnings in 1917 to a business relationship with Orville Wright and was founded on the principle of “Built on Honor” – a tradition that continues today.